The house is silent. Sunlight streams in through the bare branches of the trees. I stop shuffling around our toy room and take in the view for a moment. My attention turns to the blocks on the floor. This is the final pile of toys that I need to put away in my effort to clean up my children’s toy room. Generally I ask them to keep this room tidy, but occasionally the Clean-up Elves visit. Today is my kids’ lucky day. I’ve been focusing on organizing, containing, shelving and purging. But in front of these blocks I rest. The space that surrounds me looks like an ad for The Container Store again, expect for this pile of primary-colored wood in front of me. In this moment, I have no particular place to be aside from in front of these blocks. I pick one up, truly feeling it for the first time in ages. I feel the corners and smooth sides against my palm and the pads of my fingers. The weight of their mass evokes an impression of sturdiness. 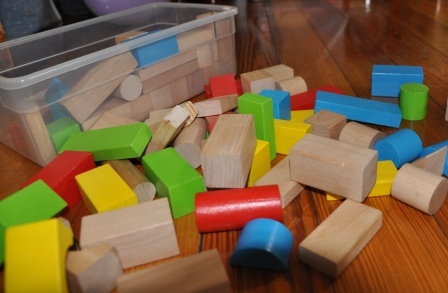 I perceive the potential… how many things you can do with these blocks. I line them up according to their size. I line them up according to their shape. I pile them together according to their color. I put blue and yellow together. I make a checkerboard pattern with the red and blue cubes. How far can I stack these blocks into the upper reaches of the room? I build a pile that creates a rocky hill for a tiny imaginary woman to climb. I have never scaled such a landscape, but the lady in my mind will. Children recreate the world as they see it and want to see it with these blocks. They lose themselves when they need to and when they can. And they “live” in those blocks. Why don’t adults do the same thing? My children grab five minutes before walking out the door for their play. We hear often how important it is for children to discover through creative activity. Why does it stop in adulthood? Why is it not essential to our development? After all, we are still growing. I am convinced that our generative abilities are the source of value in our contributions, even moreso in an era where machines can handle a lot of things. Why do we not nurture that through things as simple as these wooden blocks? My mountainous pile is done, and the clear plastic shoe box that holds these blocks sits to the side. It is time for me to put them all neatly in this organizational vessel. Instead, Ileave them in the sunlight and walk away.